Low voltage cut-off control with LED indication (a Kendrick standard!). IMPORTANT NOTE on this feature. IN STOCK! We think you will agree that this is the best Dew Controller ever made. The FX Series controllers are our heavy-duty "Prosumer" models with 4 individual adjustable heater ports and programmable power supply suitable for powering popular DSLR cameras. 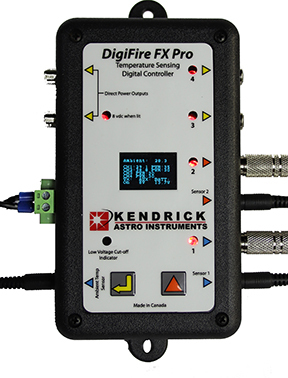 The new DigiFire FX and FX-PRO models have all the features of our former DigiFire 8 and 12 models, plus some impressive new improvements. New OLED Graphic Display which displays all settings at a glance. User Changeable Cord. We strongly recommend you "ditch the Cigarette Lighter Plug". Chose you own or add our Anderson Power Pole plugs to get all 15 Amps the unit is capable of delivering. NEW>> Disable Low Voltage Cut-Off. We don't recommend it, but if you want to drain your battery beyond repair it is now possible. Sensors included: 2 - 1 of these is the Ambient Air Temperature and the other is the Optic Temperature Sensor. Additional Sensors are optional. If you want to use Temperature Regulation on a 2nd optic (telescope), order an extra Temperature Sensor. 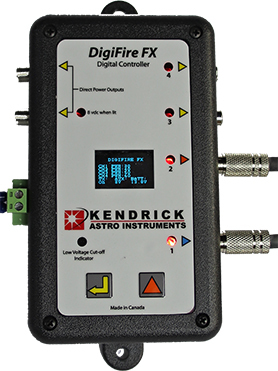 †The DSLR power supply is designed for normal astrophotography applications. Specifically, long exposures with momentary delay between exposures. It is NOT design for daytime “burst” exposures. Want a spare Power Cord? Now Available! 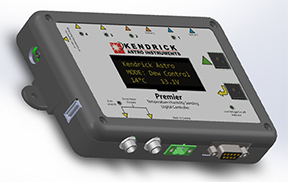 The next generation of Observatory Class Dew Controller has come off the drawing board and is now entering the pre-production phase where we test functions, fit to an enclosure, and tweak software. We have the 3rd working prototype in hand. It’s not pretty enough for photos yet. The Image you see here is a mock-up that will also change with the addition of more function buttons that will be built into a waterproof membrane. What changed from our original design? It is smaller and lighter. All versions will have an OLED Display instead of LCD Touch-Screen (not so great in cold temperatures). It MIGHT have an optional ASCOM Focuser Controller that will be compatible with popular stepper-motor focusers. This feature is certainly slowing down roll-out. It's actually easy, but with so many models of focusers and stepper motors, cables and connectors is proving to be a challenge. Optic temperature above ambient temperature control. Power to heater % control (Duty-Cycle). Choose Celsius or Fahrenheit screen display. 2.5mm Audio Jacks for optic, ambient, and humidity sensors. New optic and humidity sensor design. 2 dedicated 12 volt Accessory Power Ports to power other peripheral devices. LEDs on the heater ports. Low voltage cut-off. For those who do not want Low Voltage Cut-off, this function can be disabled via the display screen and/or the remote control software. Air temperature, Optic Temperature, Humidity and Dewpoint display. If you want to be notified when the controller becomes available, please join our Premier Controller Notification List. This will be a one time only mailing and you will not receive other product notifications from us. The old style Premier Controller is still supported and we have moved the information on this controller to it's own page and can be found at the link below. Our dew control systems require 12 volts DC. 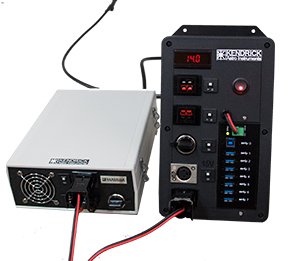 If you are using a battery to run the system, we recommend a 5 amp hour battery as a minimum. If you want to run the system from a wall plug, you will need a 120 volt to 12 volt DC "Regulated" step down power supply with a minimum output of 5 amps. How much power do you need? Add up the current draw from all connected equipment and then multiply by at least 2. Generally, you want a power supply that can deliver twice as much power as you think you might need. Otherwise, an overworked PS is going to fail or even get excessively hot. NEW Big-Honkin 25 Amp Power Supply (110VAC or 220VAC)! Big mounts, cooled CCD Cameras, Dew Heaters use a lot of juice. 25 Amps is enough power to run just about any device you would ever need.